[JSDSERVER-4519] Email domain organization association - Create and track feature requests for Atlassian products. The ability to associate email domains (e.g. @companyname.com or @mybusiness.com) to organizations. 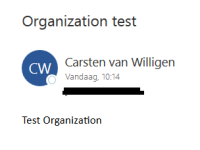 So in the event of a user emailing in or a new account being created on the service desk, their account is automatically associated with the correct organization, based on the pre-determined email domain associations. Without this, I understand you currently have to manually administer all customer accounts and manually associate them with organizations. Unfortunately this lack of feature is currently holding us back from using your product, as we get a large volume of customers contacting us on a daily basis. As soon as this type of feature is implemented, we can look at purchasing your software.